D.I.C.E. 2013: Newell Claims "Our Users Have Defeated Us"
According to Gabe Newell, Valve is currently working on "console form factor PCs" for the living room. In the D.I.C.E. 2013 Thursday Keynote speech, titled "A View on Next Steps," Gabe Newell gave his thoughts on the future of gaming hardware, expressed his skepticism of cloud-based gaming, and gave his thoughts on where user-generated content can take us in the future. There were two core ideas for his presentation, namely that "the PC ecosystem is going to expand into the living room," which is hardly surprising given Big Picture Mode's December launch, and that "there's going to be a change in what we think a game is." He suggested that most games, at some point in the future, will be "part of a connected economy," where you'll be able to "exchange goods and services in DOTA 2 for goods and services in Skyrim." According to Newell, the PC has been the "center of innovation in videogames," as the PC scales very well in function, but it has been severely lacking in novel input technologies, which consoles have done well with. Valve is hoping to change that by developing their own input devices for the PC, alongside development of a console form factor PC, which will basically mimic the convenience of a console in your living room, with all the benefits of the PC platform. "Our goal is to move things forward," he said, "We're really dependent on the success and vibrancy of the PC." Additionally, Newell believes that user-generated content is the way of the future, where development tools are free-to-play apps, and a model is developed to share the revenue from user-generated content between the game makers and the creator. "They're building content that's just as good or better than what we're building," he said, "Our users have defeated us." Similarly, the current state of Steam's user-generated content has Valve itself acting as a bit of a bottleneck due to the approvals process, which Newell would like to remedy in the future. 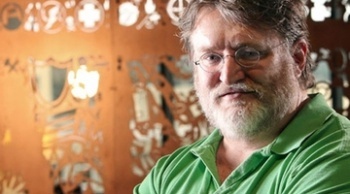 Realistically, with the next generation just around the corner, I can't imagine consoles going away any time soon, but if Gabe Newell has his way, we'll all eventually be playing PC games on our television, farming for materials in one game, and spending the fruits of our labor in another.